Whatever your faith is but be humanbeing at least and at least have some Humanity or if its no more go to animals and borrow some compassion from them and have some compassion and mercy on your own race and kind. O God I am Praying and asking for YOUR HELP you are Creator of all mankind and Creator of all creatures and ALL blessed people called Messenges PBUH and Prophet PBUH. All I know is people are in so pain and all i want is YOUR HELP. You said in all scriptures and Holy Books YOU Help us when we pray and ask for your help. Save us from the oppression of the oppressor and raise people from us to rescue the people under the oppression and right now in pain. O God I am praying give them Shelters,medicine, cloths, food and shoes and protection and peace. O God if i am the last many or first man I am praying for them and speaker and praying louder then ever for the people in pain. O GOD help us to help them and make the people realize the pain people are going through. Help them any medium or any form you can. Go there if you have resources and Visit there if God has given/blessed you with resources. Just go and see whats happening there right now. This is what a starved baby looks like. 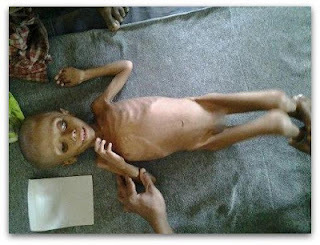 He is Rohingya No this is not Ethiopia, it is Burma There is no famine in Burma, just blockades! There is plenty of food aid waiting to be delivered to these children, but it isn't allowed through. The Rakhine children are however well fed. There is a concert in Burma on Sunday 16th December, to end human trafficking and slavery, whilst the Rohingya have been trapped in slavery for decades and are often victims of trafficking. They are also starving to death from blockades. Hundreds of thousands of them. Lets tell them about the Rohingya! Please use the links here on Twitter to raise awareness and get tweeting! The following are tags being used for the concert. We need to inform people what is really happening in Burma. Myanmar can keep Rohingya from starving. But will it? 2900 children babies + toddlers may be beyond help even with urgent treatment! A Concert For The Damned? Acc to information, Cargo carried #Rohingya 3 times to Thai-ships; 755+455+635 #Rohingya, Thai-ships sold them somewhere else. 603 #Rohingya families in Thandawli have been starving, Rakhine authority doesn't allow any aid group to help them, they need urgent food. Off to Myanmar tonight. I'll be answering some of your questions about our trip with MTV Exit. Tweet & tag them #LiveInMyanmar. At the gate of some hospitals, it is written in Burmese "Kalar are not allowed"
WFP trying to send food to starving #Rohingya of Anauk Pyin, Rathedaung town of #Arakan but Rakhine authority doesn't allow to save those #Rohingya. (this document is being moderated by Jamila Hanan. Anything promoting violence, or inaccurate info, or links to poor resources, will be removed).